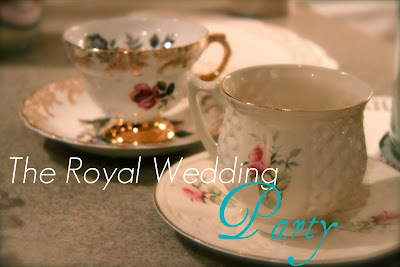 CREATE STUDIO: The Royal Wedding Party! Today was the big day! Were you one of the crazies who got up at the crack of dawn to watch William and Kate get married? My friend Jenn had a fabulous Royal Wedding Party... complete with regal tarts and breakfast casserole served on silver platters! And put on our most refined faces! But underneath all of the pomp and circumstance we had on our PJ's and fuzzy pink slippers... it was 5:00am after all! We squealed at all of the right parts and loved every minute of it! Congrats Will and Kate! Thanks for the good excuse for a party! Love that you got together and did this!!! What a great idea! The wedding was fantastic!!! Soooo sweet that you did this, and even got up early. In the UK we got a day off work! So I didn't need to get up till 10.00. How lazy is that! Oh well, I loved it. I waited until a more reasonable hour but I celebrated too!!! Your party looks fabulous!